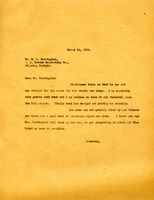 Coolidge and Carlson conveys a request that Thompson Starrett include the Berry purchase of a delivery truck body as an extra charge for laundry equipment. 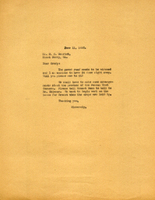 Architect Harry J. Carlson reports on correspondence with Mr. Skinner, reassuring Martha Berry that he thinks the trouble is over and things will go smoothly from now on. 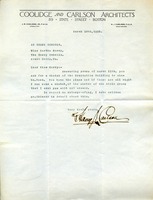 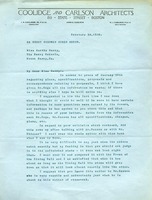 Harry J. Carlson responds to Martha Berry's request for advice about getting John E. Bierwirth, Thompson Starrett Company vice president, on the Berry Board of Trustees by counseling that she wait to discuss the matter with Bierwirth in person. 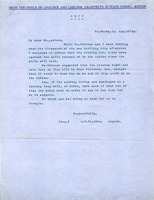 Carlson comments further on fundraising and hopes that the "Detroit friends" will postpone their visit. 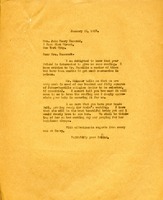 He asks Berry to have Mr. Skinner respond more fully about the dairy. 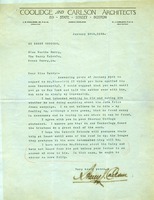 In this letter the Berry Schools ask Mr. Hoehler for help with new laundry equipment. 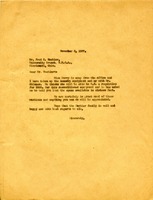 In this brief letter to Miss Berry from H. J. Carlson of Coolidge and Carlson Architects concerning the sketch for the Recitation Building that would be shown to Henry Ford. 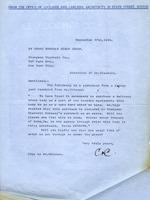 Carlson briefly talks about waterproofing in which he has written to a Mr. Skinner.